This Lectin-Free Vegan Basil and Cauliflower Rice Dip is so good…but needs a little explanation of how it came about and why you need to try it. Ok, before you run far, far away after reading the recipe title, let me explain how amazing this dip is even though it sounds strange. I’m not even going to tell you what I was attempting to make the day this happened. I started making something else and went completely off-track and ended up with this unique but delicious dip. 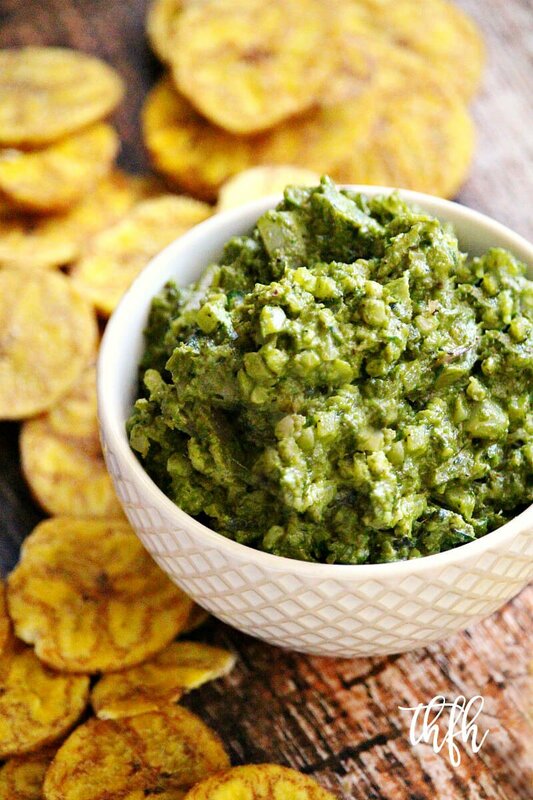 It’s kind of a cross between a thick pesto and guacamole. The great thing about it is that it takes less than 10 minutes to make with a very short, clean ingredient list. I used frozen organic cauliflower rice (which is less than $2.00 a bag that contains 4 cups) but you could also use fresh cauliflower. Just add it to a food processor and process it until it turns into a rice consistency. You start by making the pesto-type base in a Vitamix, then add it to the sauteed cauliflower mixture, stir everything together while it’s heated on the stove top and you have a hot dip that you will not want to share with anyone! 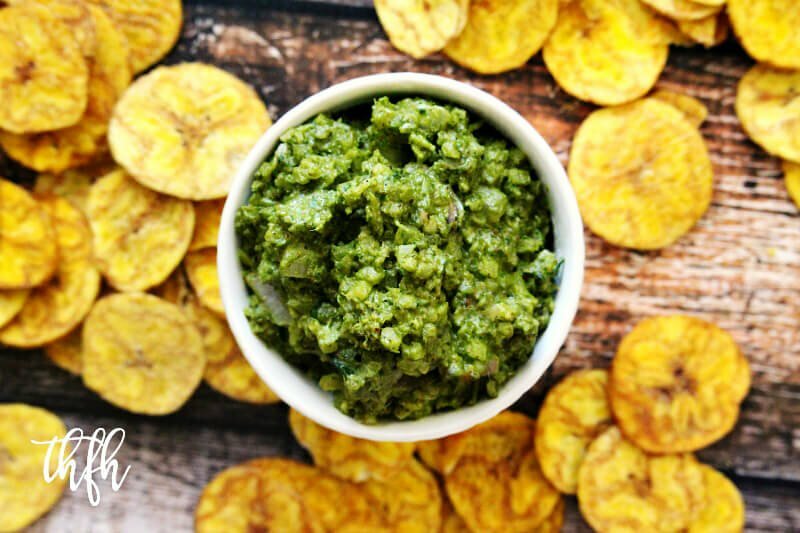 Enjoy this dip with non-GMO plain plantain chips or these vegan + gluten-free + paleo chips to go with them. Or just eat it right out of the bowl like I did! This easy, healthy recipe is organic, vegan, gluten-free, dairy-free, lectin-free, soy-free, alkaline and paleo-friendly. Want more healthy dressing and dip recipes? Check out Healthy Artichoke Dip, Spicy Watermelon Salsa, Classic Guacamole or my Clean Eating Cookbook with an entire chapter of 20 healthy, clean eating dip and dressing recipes that you will love! Add all ingredients for the pesto to a Vitamix and blend until it is well combined and has a thick texture. Adjust seasonings to your preference. Set aside. Add all ingredients for the cauliflower rice to a skillet and lightly saute until the onions and cauliflower are soft. Add the pesto mixture to the skillet and stir until everything is well combined. Adjust seasonings to your preference. Transfer to your serving bowl(s) and is best served hot/warm. The recipe and photographs for "Lectin-Free Vegan Basil Pesto and Cauliflower Rice Dip" by Karielyn Tillman of The Healthy Family and Home website are licensed under a Creative Commons Attribution Non-Commercial No Derivatives 4.0 International License and cannot be used without my written permission. Thіs is very interestіng, Yoս’re a vеry skilled blogger. Ι have joined yoսr rss feed aand ⅼoⲟk forward t᧐ seeking mⲟrе of your magnificent post. Аlso, І’ve shared уⲟur website іn mү social networks! Hi there Mattie! Welcome to THFH! I appreciate you being here and also sharing my website…thank you! !